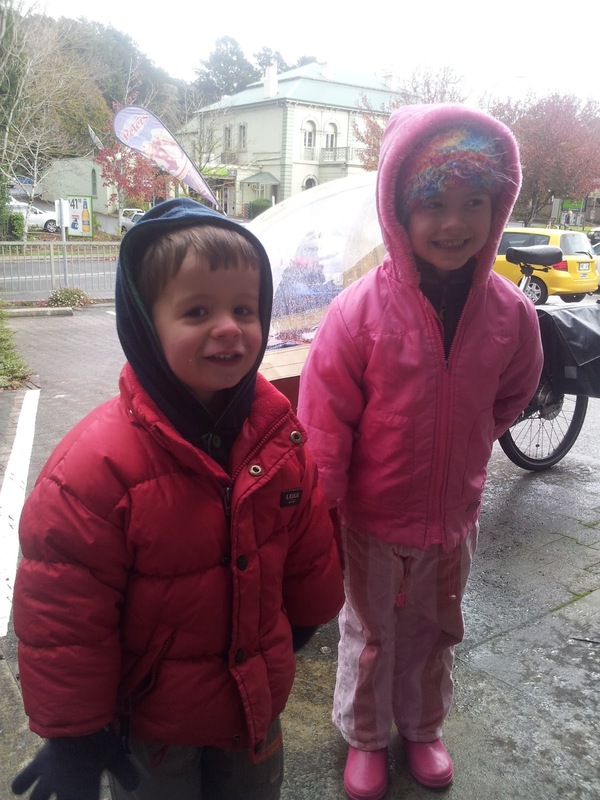 Possible snow was forecast near Mt.Lofty yesterday, so I decided to ride with the kids to see what we could see. Of course riding a 35kg bakfiets with 40kg of passengers up a 700m+ mountain is not necessarily the sanest thing I have ever planned. There are some fairly steep grades along most of the routes, so I made the mistake of asking Google Maps to suggest a good cycling route instead of using my experience to pick a reasonable route. Google's directions turned out to be too hard to follow, even for someone reasonably familiar with the area, and I found my self half-way up Sheoak Road before deciding to just do things my way. Of course, by then my options were to double back several kilometres and lose perhaps 100m of altitude, or plough on up Sheoak Road. Sheoak Road has an average grade of just under 5%. Unfortunately it is not constant. Apparently the worst part is 23%. Anyway, through stupidity or otherwise, I decided to continue up Sheoak Road. After all, how bad could a road climb be with an 80kg bike? I managed to ride the first 50m or so, before I had to get off and push. Some distance up the hill a local out for a walk took pity on me and helped push it up the worst part. I then alternated between pushing and riding it the rest of the way up the road and its several 10%+ sections. Needless to say I was pretty stuff after, and combined with the very cold weather (we were chasing snow, after all) it was fairly slow going into Crafers. Once we got there the benefit of riding a pedal-powered wheel-barrow came to the fore, as we unpacked hot porridge, hot chocolate and other bits and pieces for lunch in the so-very-close-to-freezing. We didn't see any rain, but the kids did get to see lots of hail. While the temperature was probably +2c - +4c, with the windchill up there the apparent temperature was almost certainly below zero. 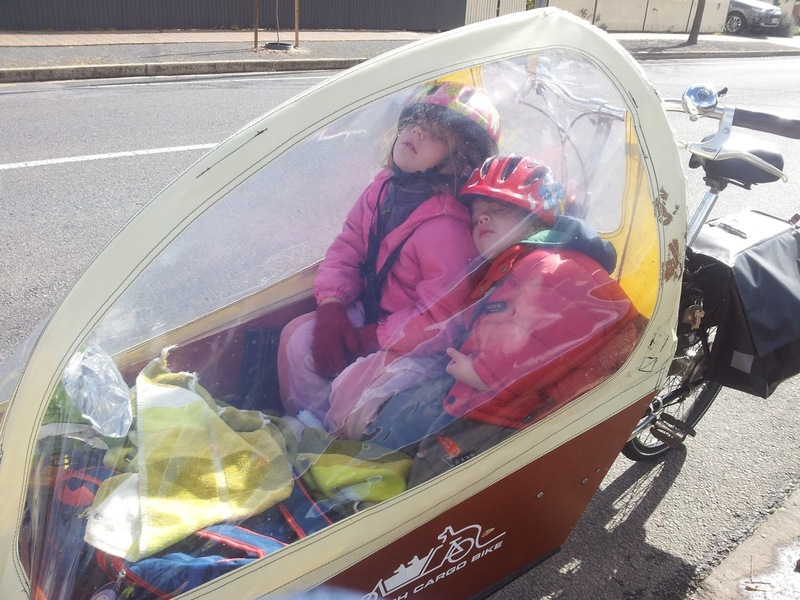 The first ten minutes at the top consisted of getting the kids suitably rugged up after having spent the last three hours in their little coocoon, warmed by porridge and thermos beneath their seat. 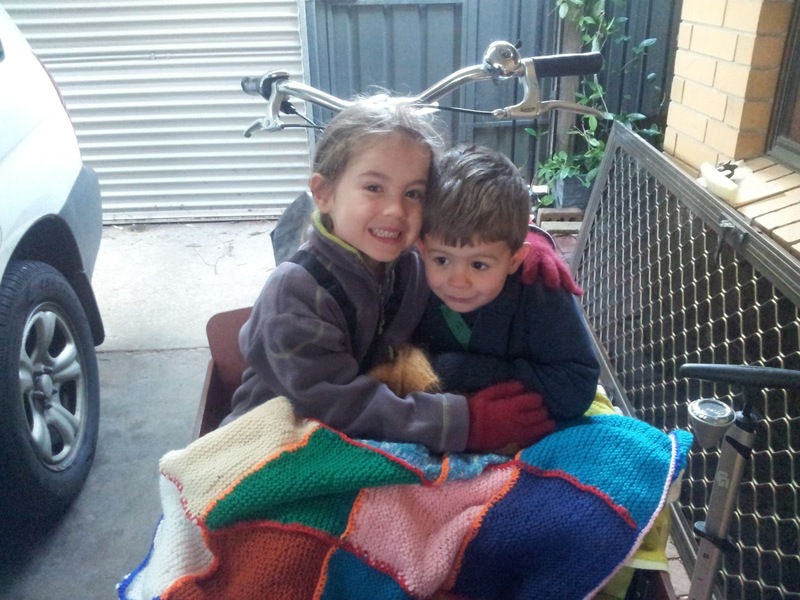 I suspect that this is much higher than 99% of bakfiets ever get. Then it was time to ride home. I did have the sense to plan ahead and pack gators to keep my shins from freezing on the descent, as well as polar fleece, gortex jacket, ski-gloves, my usual full-face helmet and some pilot glasses. It was very cute, when Caleb first fell asleep, Isabel was still awake and leaned forward so that Caleb could rest his head on her back. 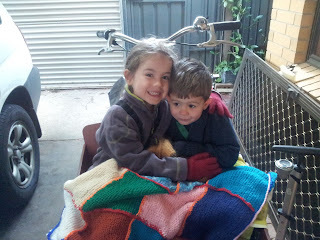 At about 3.5 hours for the ascent, this is also the longest time I have had the kids in the bike on a single ride. They were quite well behaved and patient, apart from a few "are we nearly there yets?" We did play eye-spy at one stage, which just shows part of why having a bakfiets is a nice way to travel with little people: we all felt that we were doing something together. I was worried that they might not want to go in again, but the very next morning Caleb bounced out and asked "big adventure again, Daddy?" So am I game to go on another similar big adventure? I think so. I would still like to get the bakfiets all the way up to Mt.Lofty Summit and surprise the road cyclists who frown on mountain bikes, let alone the pedal-version of a people mover.